Judge Timothy A. Williams serves as the Juvenile Court Judge for Washington County. The position is an elected, non-partisan office with a six-year term. He was first elected in February 1997. Judge Williams is a 1984 graduate of Ohio Northern University law school. 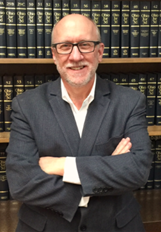 He served as an associate editor of the Ohio Northern University Law Review. After graduation, he entered private practice from 1984 through 1997. From 1989 to 1997 he also served as a part-time Juvenile Court Magistrate for Washington County. Judge Williams appointed Attorney Randall E. Jedlink to serve as a full-time Magistrate for the Juvenile Court on January 3, 2017, to help handle the caseload of the Court. Magistrate Jedlink is a 2010 graduate of University of Toledo College of Law and a 2007 graduate of Purdue University with a BA in Political Science. To monitor the behavior of the children that the Judge and Magistrate place on probation, the Court has a juvenile probation staff consisting of three full time probation officers. The day-to-day operation of the Court, including supervision of all employees, is managed by Court Administrator, Rae A. Ward. Ms. Ward holds a National Certification in Court Management from the National Center for State Courts. If you have questions or concerns about the operation of the Court or the Center, please contact Ms. Ward by phone at (740) 373-6623 Ext. 2402 or by email. Trouble opening the email link?